Dyson V6 vs. V8 - Is the V8 Really Worth $500? Dyson’s V-series has been a popular vacuum choice for many years. But which is best? Today we’ll compare the Dyson V6 vs. V8 in a head-to-head battle. Which is the better stick vacuum? Continue reading below to find out. The Dyson V6 vs. Dyson V8 are two older Dyson cordless models on the market today, the newest being the V10, see our Dyson V10 review for more info. The V6 and V8 have a similar look, as far as design and aesthetics go. ALIGNMENT | Both the V6 and V8 have the same alignment of dust bin, cyclones, and motor. Compared the the Dyson V10, which aligns all three of these elements, the V6 and V8 have a dust bin that is perpendicular to the motor and cyclones. Dyson claims that having all three elements aligned on the V10 increased suction power and improves airflow, but it does make the unit longer and a little heavier, especially when using it as a handheld vacuum. The V6 and V8, as handhelds, are both a little lighter and easier to manage. DESIGNED IN PARTS | Both the V6 and V8 also are designed in parts, in that the series of parts can be assembled as a stick vacuum or a handheld vacuum. The parts consist of a motor (with cyclones), the dust bin, the extension wand, and the cleaning head. There are simple connections that allow each of these segments to snap onto the next, and swapping out tools or cleaning heads is a simple task. CYCLONE DESIGN | The Dyson V6 and Dyson V8 both use the two-tier, 15 cyclone design. These cyclones help to spin the dirt, dust and debris through a series of smaller cyclones. Through the power of centrifuge, these Dysons can both capture dirt particles as small as 0.3 microns. This system uses a washable filter, which means lower maintenance costs. CLEANING HEADS | Dyson currently offers three cleaning heads; Direct Drive, Torque Drive, and the Fluffy cleaning head. Both the Dyson V6 and the V8 have models that come with the Direct Drive and / or the Fluffy cleaning head. 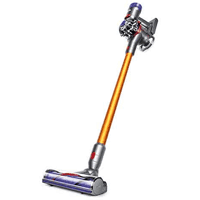 The Dyson V6 stick vacuum is 47.5” high, 9.8” wide, and 8.2” deep. All parts assembled, it weighs about 4.5 pounds. Comparably, the Dyson V8 is 49” tall, 9.9” wide, and 8.9” deep. All parts assembled, this vacuum weighs around 5.75 pounds. The following table documents all accessories included with the Dyson models we tested at the time of review. Dyson is continuously updating and changing included accessories, so the exact accessories included with your purchase may vary. In this comparison, we’re looking at the Dyson V6 HEPA (2017 model) and the Dyson V8 Animal. When it comes to accessories, the biggest difference between model types is the number of accessories and cleaning heads. Dyson V6 vs. V8 accessories and parts. V6 accessories on the left. V8 accessories on the right. Charger: The charger plugs into the wall and your vacuum, allowing it to charge the battery before each cleaning cycle. Docking station: The dock attaches to the wall and allows you to hang up your Dyson while it’s charging. This can be especially handy because the Dyson V6 doesn’t easily stand on its own. Cleaning head(s) (Direct Drive or Fluffy, depending on model): The cleaning head varies between the Direct Drive cleaning head and the Fluffy soft roller cleaning head. Check your model to know exactly which one comes with your vacuum. Mini soft dusting brush: This brush is a linear dusting brush with soft bristles—great for cleaning wood furniture, baseboards, or crown molding. Combination tool: This tool works as a hard nozzle brush or a soft dusting brush. Crevice tool: The tool helps to reach in tight or narrow spaces, collecting small or large debris. Mini motorhead: The motorhead brush has two brushes that rotate opposite of each other, which helps prevent tangles. This is especially useful for pet hair or cleaning upholstery. The V8 stick vacuum includes all of the same attachments as the V6, but with the V8, these attachments are “Quick Release”, meaning there is a red button on the attachment that releases it from the vacuum. Also, when you order from Dyson.com, they provide three additional tools at no extra cost when you auto-register your vacuum. Tools vary from model, but may include: colored wands, an additional soft dusting brush, up-top adapter for cleaning high spaces, mattress tool, stiff bristle brush, multi-angle brush, or a Dyson tool bag for accessory storage. Overall performance on the hardwood floor cleaning tests was quite good. Both the Dyson V6 and Dyson V8 removed 99%+ of all rice, kitty litter, and sugar tests. The only slight hiccup for both vacuums was on the cereal test, where they both scored around half. For both of these tests we used the Direct Drive cleaning head, which admittedly is not as good on hardwood floors as Dyson’s Fluffy Cleaning head is. However, for the sake of comparison we wanted to see how they each performed. If you do have hardwood floors and need to clean up large debris often you’ll want to make sure you go with the Dyson V6 Absolute or Dyson V8 Absolute model, as they both include the Fluffy Cleaning head. We would expect nearly flawless cleaning performance on both the V6 and V8 (as we experienced with the Dyson V10‘s Fluffy cleaning head). RELATED: If you need a vacuum specifically for hardwood floors, see two great guides here and here. Our low pile carpet tests showed a similar story. The Dyson V6 again scored virtually flawlessly on rice, kitty, litter and sugar. Whereas the Dyson V8 scored virtually flawless on all 4 debris type tests. The V6 again had a slight struggle on the cereal test, removing only 76% of the total debris. The design of the V6 Direct Drive cleaning head is a bit smaller than the V8. As a result, it had a tendency to push some of the cereal out in front of the vacuum, and not rolling over the top to remove it. We think this is the primary reason why it wasn’t able to as easily remove the cereal debris compared to the V8. High pile cleaning performance for both the V6 and Dyson V8 was basically the same as the low pile carpet tests. The Dyson V8 again had nearly flawless cleaning performance across all 4 cleaning types. While the Dyson V6 was essentially perfect on rice, kitty litter, and sugar, but it continued to struggle with cereal. Again, the smaller cleaning head on the V6 posed problems with large debris, resulting in only 70% of cereal being removed. For our complete testing data see the full Dyson V6 review and Dyson V8 review. The usability between the Dyson V6 and the Dyson V8 is fairly similar, but there are a few differences to note. Considering unboxing, both vacuums are basically the same. They come boxed, with each part individually wrapped and protected. There are quite a few parts and pieces so the unboxing may take some time to get all the parts out and organized. Setting up these vacuums is pretty straight-forward. Both vacuums have simple connections that piece together the vacuum. The V6 accessories have a release latch that is on the actual vacuum itself. The V8 accessories have been redesigned to be “quick release”, which means that they have a large red button on the accessory. When pressed, this releases the accessory from the vacuum, making it even easier to swap out tools. RELATED – How does the V6 compare to the V10? Find out in our Dyson V6 vs. v10 comparison. For daily use, the V6 and V8 are also similar. They both have an on / off switch that works like a trigger—the vacuum only runs when you press it down. This helps to conserve battery life, but may be an issue for older users or those with weaker hands. To clean more spaces, both the V6 and the V8 can convert between stick vacuums and portable handhelds. As a handheld, you can use the extension wand (for cleaning higher spaces) or you can connect accessories directly to the handheld portion. Emptying the dust bin is one area that is drastically different between the V6 and V8 model. Dyson V6’s dust bin is emptied with a lever on the interior trigger that’s pushed down. Dyson V8’s dust bin is emptied with a lever on top of the unit that’s pulled up. With the V6, there is a latch on the back of the dust bin that slides down to release the dust bin cap. As the cap opens, debris can fall into the trash can. Some people find this method to be a little unsanitary since some debris, like pet hair, can get caught in the dust bin and you may have to pull it out to get the bin completely empty. With the V8, it’s a little bit of a cleaner process. To empty the dust bin, you release a latch on the top of the canister and pull upward. This slides the entire top off of the vacuum, allowing dirt and debris to freely fall into the trash bin. With this method, the debis is almost forced out, by the design of the sliding mechanism. RELATED – Wonder how the V8 compares to Dyson’s best model? Check it out in our Dyson V8 vs. V10 vacuum battle. The maneuverability of the V6 and V8 are pretty similar as well since they both use the same cleaning heads, extension wands, and in-hand cyclone design. TIGHT TURNS | Both vacuums have a 90 degree turning radius and a narrow cleaning head height, which allows it squeeze under furniture and tight spaces. For the sake of comparison, I would call the maneuverability category a “draw”. Both the Dyson V6 and V8 can turn ultra tight 90° turns, are lightweight, and can lay nearly flat. The maintenance tasks to properly care for the v6 and V8 are pretty simple and basically the same. As mentioned above, the V6 and V8 use a similar style dust bin and a washable lifetime filter. The battery for the V8 is a bit more expensive, but it’s also got a longer run time. Annual maintenance costs on the Dyson V6 will be around $18 / year, which covers replacing the battery every 2 years. The battery is certainly an area of improvement between the V6 and V8 stick vacuum. V6 Battery | The Dyson V6 has a 2,200 mAh Lithium-ion battery with up to a 20-minute run time, depending on the cleaning mode. In “Powerful” mode, it can run for up to 10 minutes with a motorized cleaner head or up to 6 minutes in “Max” mode. It takes about 3.5 hours to fully charge the battery and overall, the battery has a lifespan of between 1-2 years. V8 Battery | The Dyson V8 has a 2,800 mAh Lithium-ion battery with up to a 40-minute run time, depending on the cleaning mode. In “Powerful” mode, it can run for up to 20 minutes with the motorized cleaner head. In “Max” mode, it can run for up to 7 minutes. It’ll generate a full charge in about 5 hours and has a battery lifespan of 1-2 years. All vacuum reviews on Modern Castle go through our noise test. For this test we use a sound meter to measure noise in terms of decibels from approximately 3′ away from the vacuum. The Dyson V8 is slightly quieter at 73 dB, compared to the Dyson V6, which is 76 dB. However, that 3 decibel difference is fairly minor. Overall, I would say that the V6 is a solid value for the money. It’s currently priced reasonably, which is a rare find for a Dyson. While the run time is certainly a little short, the overall design, maneuverability, usability, and general features are comparable to newer models like the Dyson V8 or Dyson V10. In addition, some V6 models, like the V6 Absolute have the option to include the soft roller “Fluffy” cleaning head. This was one addition that helped bring the V6 up to speed with newer models. The soft cleaning head was designed to capture large debris on hard floor types and is a nice inclusion to round out the V6 package. RELATED – Looking for convenience and value? See our best cheap robot vacuums, including some of our favorites, the Roomba 690, Ecovacs Deebot N79, and iLife A4s. Lastly, when purchased from Dyson.com, you have the option to auto-register your new vacuum, and receive three free cleaning tools of your choice. While this isn’t included from retailers outside of Dyson, is is definitely something that adds to the overall value of this machine. The Dyson V8 is a little more expensive that the V6 model, but I wouldn’t say that the value is negatively affected by that. With the higher price, you get twice the run time, a motor that generates 20% stronger suction, and a redesigned dust bin that helps make emptying and cleaning the vacuum easier. In the eyes of an average consumer, these are valuable additions and certainly worth something in overall value. Currently, Dyson.com only offers the V8 Absolute, which does include the Fluffy roller head. For homes with a large amount of hardwoods or other hard flooring, the soft roller cleaning head could be a very valuable part of the package. RELATED – For more information on Dyson see our complete Dyson vacuum reviews guide. Weight 4.5 lbs. 5.75 lbs. The V8 motor produces almost 20% more suction power over the V6 motor, according to Dyson, as well as a post-motor HEPA filter for allergy protection. The Dyson V6 stick vacuum is the most economical cordless stick vacuum in the Dyson market currently. The design and usability is similar to the V8 stick, while the biggest drawback is its shorter run time. But for small homes or people who prefer shorter cleaning cycles for quick pick-up, the V6 could be an excellent option for you. Want a lower price tag – The Dyson V6 is, currently, the only cordless stick models that comes in at a reasonable price. It comes with many of the same accessories, design, and cleaning performance. Don’t mind a shorter run time – The V6 model maxes out at a 20 minute run time and if you’re running on max mode, it’s even shorter, at a 6-minute max run time. If you prefer shorter cleaning cycles or quick pick-ups, the V6 may be plenty of time for you, but for whole-home cleaning, you may need the extra time that the V8 affords. For more information on the Dyson V6 see here. The Dyson V8 is a nice improvement over the V6 model. It’s got a longer run time, a larger battery, and a redesigned motor making the V8 a real contender for whole-home cleaning. The price tag is greater than that of the V6, but the improvements warrant the increase, in my opinion. Want a stronger motor – With the improved motor, the V8 offers 20% stronger suction than the V6, which may make a difference, especially for high pile carpet or plush rugs. Want a longer run time – The V8 offers a 40-minute run time, twice the run time of the Dyson V6. If you prefer longer cleaning cycles or simply don’t want to charge up as often, the V8 has the battery power to keep working longer. Regularly clean up pet hair – For pet hair cleanup, the redesigned dust bin is a significant improvement over the V6 model. With the V8, the dust is removed more forcefully, compared to the V6 where the dust bin latch just kind of pops open, leaving you to scoop out caught debris, like pet hair from around the bin. For more information on the Dyson V8 see here.